I found this recipe on one of my favorite websites for good vegan recipes, the Fat Free Vegan Kitchen blog. The original recipe has both walnuts and dried cherries added to it, which sounds delicious, but I don't always have those on hand, so I tried out the recipe without any cherries or walnuts, and it still turned out really good. In a large bowl, mash the bananas and add the lemon juice, apple sauce, and sugar. Stir well to combine. In a separate bowl, combine the remaining ingredients. Add the dry ingredients to the banana mixture, and stir just until the mixture is well-combined. Spray a loaf pan with non-stick spray. Spread the mixture evenly in the pan and bake until a toothpick or knife inserted in the center comes out clean, about 50 minutes (convection oven is 45 min). Allow to cool before serving. 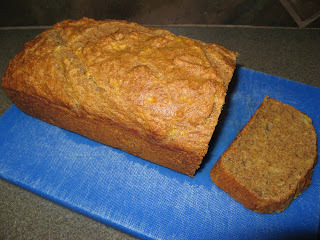 In the original recipe, she added this note: "Fat-free quickbreads like this really benefit from being allowed to cool completely, which is why they often taste better the next day. The crust, which is chewier than breads with oil, will gather moisture and softness over time. Ignore the tempting aroma; pleasure delayed will be pleasure multiplied." I still eat some as soon as it gets out of the oven, but it is good the next day. I've been meaning to post for a while now. This recipe is one of my favorites here, though, I have to admit, I have several. Every time I find a recipe like this one, I always have to wonder why they ever started putting oil in it in th first place. So much better without it - not to mention cleaner. Thanks, Thanks, Thanks! I made this today and sprinkled the top with a sucanot/cinnamon mixture. Tasty!